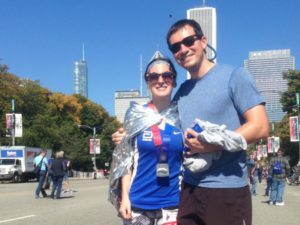 On October 8, Team CIF will head to the starting line of the Bank of America Chicago Marathon. They’ll represent Center for Independent Futures on the course to raise funds for the hopes and dreams of individuals with disabilities. Race day represents the culmination of months of hard work and dedication. Help them reach their team fundraising goal of $10,000 by visiting this link and clicking on the red button that says “Donate to this Fundraiser.” You can also support individual runners from their fundraising links at the bottom of the page. Send a note of encouragement to our runners! Email Elizabeth at emale@independentfutures.com to share any messages that you would like to have passed on to the team. Let them know you appreciate their hard work and that you’ll be rooting for them on race day! Cheer on the team with the Center for Independent Futures crew on race day! Every year, participants, staff, and supporters gather on the course at the Charity Block party, a mile that celebrates the community organizations involved in the marathon. The cheering squad enjoys breakfast and cheers on the runners as they pass. To join the group for this fun and inspiring morning, email Elizabeth at emale@independentfutures.com. If you have any questions about how to support Team CIF, contact Elizabeth at emale@independentfutures.com or (847) 328-2044.